The innovative BXpanded Quick-On Bucket Hooks install literally in seconds. No welding, drilling, or tools are required. ABSOLUTELY NO MODIFICATIONS to the tractor or loader are required! These hooks give the capability of lifting bulky and heavy items with chains or straps. 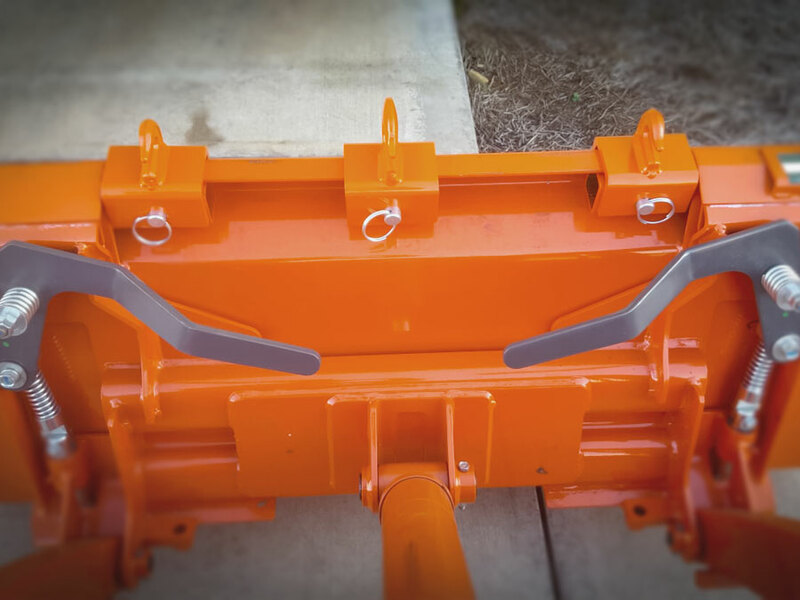 They can be used in multiples, can be positioned and re-positioned almost anywhere along the top of the bucket and do not interfere with normal Front End Loader operations. The hooks do not apply pressure to the relatively easy-to-bend top flange of the bucket. They do not obscure nor require removal or modification of the bucket level indicator. 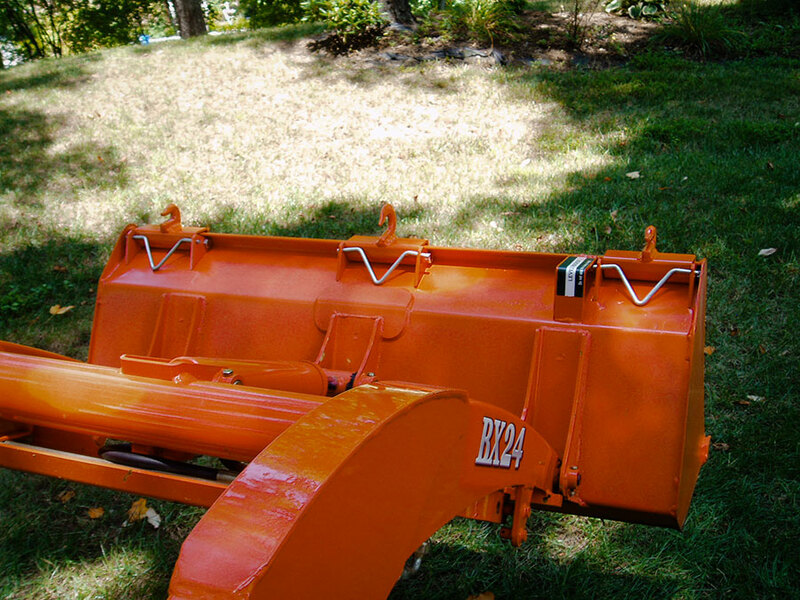 You can haul your machine back and forth to a dealer or welding shop where they’ll grind the paint from the bucket, weld on a hook, maybe with a hunk of steel as a reinforcement, and then probably leave it to you to sand, clean then repaint the burned area. They’ll ask for a chunk of your hard earned cash for the favor. Even worse, you might have to leave the machine until they “get around to it”. If you need to relocate the hook or replace it with a different type, you’re outta’ luck! OR, you can snap on a BXpanded hook. Slip it into position, insert the special locking pin and push down to lock. Takes as long to say as it takes to do! Want to add an extra slip hook? No problem! Want a hook in the middle? OK! Want 4 grab hooks? Why not? And, ALL WITH NO TOOLS! NO WELDING, NO DRILLING, NO PAINTING, NO UGLY PATCHED UP PAINT!!! We think they look pretty cool too! They work great with our Quick-On BXpanded pallet/brush forks too! Check ‘em out! I bought 2 of these hooks and love them! Easy to install and now no more wrapping straps and chains around the arms or bucket. I'm in Canada and the service was great! I'm buying more attachments for my BX in the spring! The hooks arrived today. And, as it turned out, they were amazingly easy to install--literally, took less than 30 seconds each. I had read the reviews so knew that some people had had trouble getting them on the first time. So, I first sat down to read the installation instructions (I know, what guy actually does that!). Gotta say, the instructions were more than confusing. A picture or two would have helped a great deal. Then, armed with the instructions, a leather mallet, and some liquid soap (recommended in the instructions), I headed out to the tractor. With a few false starts, the hooks slipped right on and easily locked into place. Could not have been easier. Used them to lift some sections of an oak tree so I could cut them into stove lengths. Worked perfectly. Thank you for a great product! These went on in less time than it is taking to write this review! Another home run, Had all 3 on with no tools in about the time it takes to smoke a cigarette! Heavy duty and fit tight. Next up is the light kit! Got the hooks and still haven't figured out how to get them locked in place. Put a little more bend in them as Harry suggested and they still don't lock down. I have the small curl lip. They don't come off when in use but will slide back and forth if you pull on a load sideways. I use the heck out of them pulling downed trees so they are very useful. &return&≠wline&&return&≠wline&BXpanded said: Tom give us a call and we'll see if we can help. Bought a pair of these three years ago. Easy on and off in seconds and well-made. Highly recommended. Great addition to the BX! Withouth these, there is not a great place to connect chains. I've barely used them- pulled the boat hoist onto shore, hauled a pump around, downed a few trees. Quick and easy, the way it should have been from the factory. Bought chain hooks and pallet forks. Paid for themselves in one weekend moving a mountain of brush. Also picked a two person hot tub with the pallet forks. Was able to move it alone. Got a pair of these hooks some months back. They are very well make. Worth the money. Thought I would only use them once in a while - I leave them on all of the time now. If you have a FEL on your BX (or B), this is one of the best and most useful add-ons you can buy. Get the 3/8 inch version. There is not enough space here to write about all of the uses for these hooks and a few good chains! Initially had a hard time getting the clamps to slide over the lip. Called Harry and he suggested a little dish soap and it worked. Worth every penny. 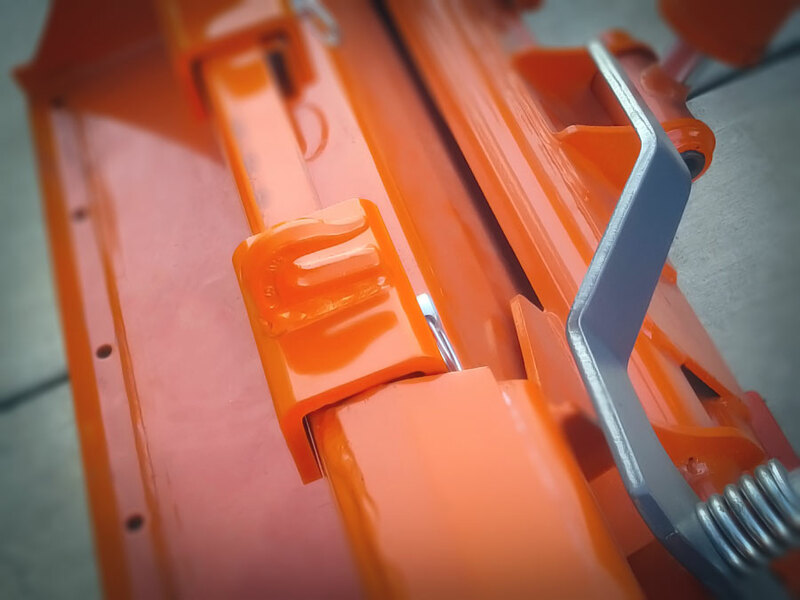 No more sliding chains wrapped around the bucket or stress damage risk. Very strong, Very well made and personal service was amazing. Worth every penny to me. Firstly.........I am mechanically challenged ! I bought a pair of these hooks and it took me about 5 mins to install........now i know how, it would take 30 seconds. Also purchased a Piranah bar and installed myself (just watch the Youtube video) that project took about 30 mins. BXPANDED is a great company selling great products.........Their products are high quality and enhance the tractor enormously. Highly recommend. Love these. Hooked on in 30 seconds first time and have already used to pull out an old engine block. Well worth the money. Hooks arrived today... snapped them on and off easily. Bought the 5/16in. Easy to hook a chain on now and quick and no holes or welding of bucket! Very nicely made. Went on very easily. Bought the 5/16 vesion. HAvent put them to use yet but seem very stable. Parts didn't fit. Operator error. Rep was very patient going thru the installation process. After more operator error, I finally got them installed,"easily". I removed them and reinstalled them easily. Wow. One more great attachment from these guys. I'd give them 6* if instructions contained pictures. Amazed at easy install and the great power hold they have built into them. Tested for five days to prove them to last for live of my tractor. Q: Are these hooks $ 179 apiece? A: They are $179 for a set of 2 bucket hooks. Was this answer helpful? 33 of 33 Customer(s) found this Answer helpful.